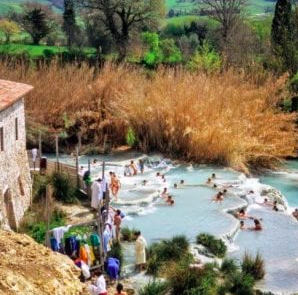 The Cascatelle del Gorello free hot springs located in the countryside near Saturnia, Grosseto may introduce a ticket quota by April 2020 in an effort to preserve the natural environment and to discourage large influxes of tourists and the rubbish they often leave behind. A popular tourist destination, the Saturnia hot springs attracts as many as 3,000 people on a sunny day. There are actually two ways to experience the hot sulphur springs: at the source (via a private four-star resort) or down the road at the cascades open to the public at no charge. The natural cascades are greenish gray with clay deposits, nestled into the rolling hills. Bathers hop in the tepid water and slather on clay for ad hoc treatments. The nearby town that manages Saturnia’s free hot springs that are outside the hotel are currently considering implementing a quota system restricting the number of visitors by introducing tickets. 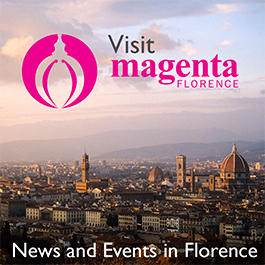 According to their statement to Repubblica, tickets will not include an entrance fee but rather serve to limit access to the hot springs to combat the environmental degradation caused by large numbers of visitors and their rubbish. Residents or those staying in nearby hotels, farmhouses and bed & breakfasts will be exempted from the proposed regulation. According to Il Tirreno, the management aims to preserve Saturnia’s natural environment and foster ‘slower’ tourism, which in turn, benefits local accommodation and economic activities. Currently many weekend visitors of the Saturnia hot springs only stay for the day, while others illegally set up tents. Further issues are caused by the overflowing car park that encroaches on the area. The potential implementation of the quota in April 2020 will coincide with the expiration of the free loan agreement signed by the municipality, which has not requested renewal. The mayor of Monte Argentario, Franco Borghini, has also asked for assistance from WWF and Legambiente in developing measures to limit access to some areas of Maremma, which is what the local area is called.